As you may already know, I have been attending the Bethel Memorial Baptist Church in the Palmer Township section of Easton, PA for a few years now. 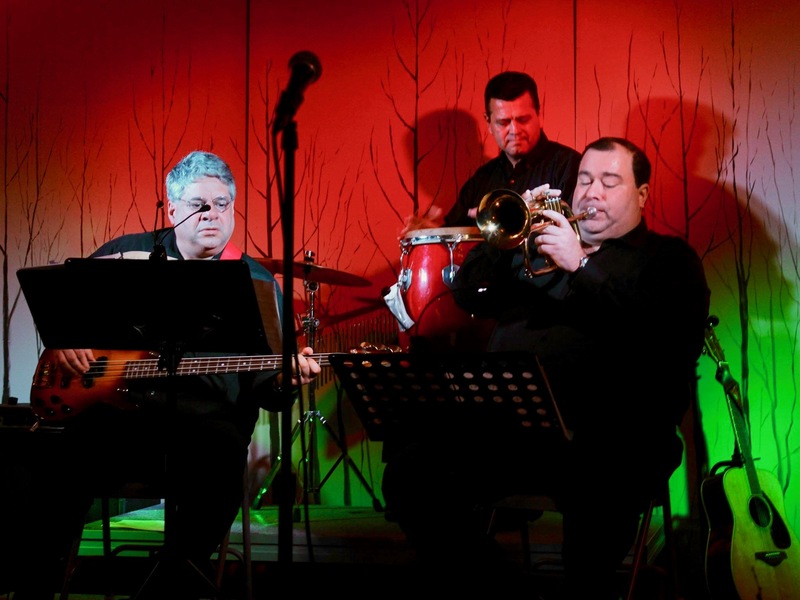 I am enjoying my time and serving musically whenever I can. I have always been a big believer that a strong way of improving the church community is to increase outreach and fellowship opportunities including hosting more public events. 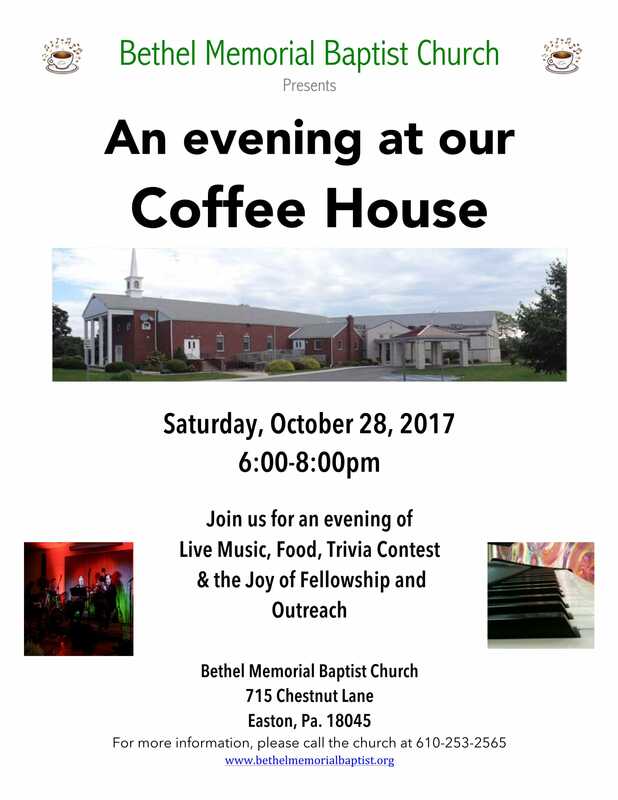 Having worked behind the scenes in organizing 3 coffee house events at the Pilgrim Presbyterian Church in Phillipsburg, NJ, I really felt this idea would resonate well with the congregation and be a wonderful chance to reach out to neighbors, friends and extended family members to share this time together. I have seen the success of “Coffee House” events and strongly believed that if we held our first, it would be a great success. So, I began to spread the word about hosting one and looked for those interested in serving on a committee. Through word of mouth and prayer, the vision was established and we had a group interested in organizing it so it was now time to approach the leadership for approval. I was very pleased to receive an email from our pastor telling me that the idea was approved and to begin planning an event. Our event is upon us and is going to be held on Saturday, October 28 at 6:00pm in the multi-purpose room downstairs in the church. The vision of this is to create a cozy atmosphere within the church where people can come without having the stress of having to bring something. I wanted a night out that would be social and rewarding yet still deliver a good Christian message. We can be with friends and church members sharing good food and music. I noticed that after each of the three events at the Pilgrim Church, there was a noticeable surge of enthusiasm and energy within the church. Each of the events was held on a Saturday so the next day in church there was a great feeling of camaraderie. It is a great recipe of success for the church. Whenever a church can bring people together socially and they have a great time, it is a great thing. But, when you add into that a strong Christian message it will actually draw people closer to the church and ultimately God. Two great things to happen any church and anyone! Although leading this charge has been a tremendous amount of work, lots of phone calls, meetings and decisions to make, I am Blessed to have a great committee to work with and a growing spirit for this event within the church. We have a floor plan design to really transform our multi-purpose room into a quaint, yet classy restaurant feel with a stage. We have 16 great performances lined up over two sets. Plus, what has really been a big hit in our other events has been the trivia contest. During the intermission, the audience gets to be a participant. I created a trivia contest mainly of pop culture, TV and movie questions from yesteryear that definitely create a nostalgic feeling. I also added an audio section so everyone gets to hear some great sounds of the past. Again, this will be a great time for everyone. In addition to the entertainment and trivia, we have a lot of great refreshment available. The best part of it all is, it is free and there is no admission to enter. Anyone can come. If you are reading this and will be around on the 28th, please come over and check out this event. It will be fun. I want people to feel like they can come to church for events other than just a Sunday service. To be able to know that there is so much more than just one hour a week! An opportunity to come to an event that does not have a sermon yet is still very spiritually rewarding. I really believe this event will do that. We have been working hard to advertise and share the word of this event. If you are able, I would love to see you attend. If you need directions or have any questions, please feel free to call me (908) 619-4502. I would be only too glad to assist you. Next Article Next Article: The Music of Gloria Estefan is Alive and Well!